The federal government finds itself in an awkward spot when it comes to foreign investment treaties. Canada lined up with an American model for investor-state dispute resolution, but the Trump administration's gone sour on it. It's making a NAFTA rewrite rather complicated. Corporations love it. Washington hates it. Canada is defending it - but maybe not for much longer. The Canadian government finds itself in an awkward spot when it comes to foreign investment treaties. Because so much of Canada's trade is with the United States, it made sense for Canada to use an American model for its approach to investor-state dispute settlement, or ISDS — the mechanism foreign companies use to sue states for damages when they believe they've been unjustifiably harmed by government decisions. U.S. companies may want it, but the Trump administration is no fan of ISDS as it's currently set out in Chapter 11 of the North American Free Trade Agreement. Canadian negotiators must decide whether they're on board with joining the U.S. and Mexico in watering it down. 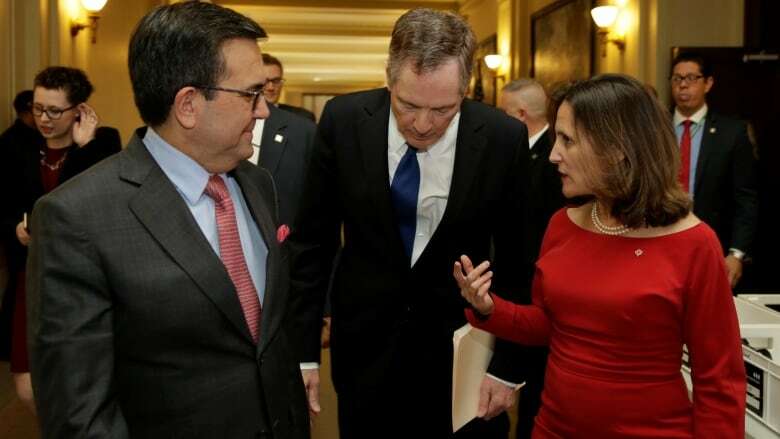 "Because this is something that [U.S. Trade Representative Robert] Lighthizer has a personal vendetta against, this is something that everyone has to deal with, not just the United States," said Inu Manak, a Canadian researcher and a visiting scholar at the Cato Institute, a Washington-based think tank that promotes free market views. Canada has been dealing with populist skepticism about ISDS — with the argument that it prioritizes the rights of corporations over sovereign states — since long before the current NAFTA talks launched. One of its major trade agreements had a near-death experience over it. When Trudeau's Liberals took power, Canada's efforts to implement the trade deal it negotiated with the European Union had stalled. The Europeans, following a massive public consultation process, concluded they no longer liked the ISDS provisions they'd agreed on. Thousands of protestors hit the streets across Europe, warning that their elected governments would no longer be free to make environmental or labour laws without being sued. Then-international trade minister Chrystia Freeland opted to shift her position rather than dig in — by endorsing a new European proposal for a multilateral investment court, where permanent judges would arbitrate fights between corporate investors and governments, instead of ad hoc panels of lawyers and academics. ISDS remains Canada's approach elsewhere — not only in NAFTA, but also in the 12-country Trans-Pacific Partnership all three NAFTA partners signed. When President Donald Trump took office, the U.S. bailed on the TPP — but the TPP's dispute settlement model remains in the text now being ratified by the remaining 11 countries, including Canada. In the midst of this muddle, Canada launched a public consultation period on Aug. 14 to review all its foreign investment treaties — including 34 bilateral investment treaties as well as the investment provisions included in an additional 20 trade agreements. The late-October deadline lands after the current Sept. 30 target date for a revised NAFTA text. "I think this is a little late in the game to bring this up now," Manak said. "It's super-bizarre." International Trade Diversification Minister Jim Carr told CBC News said the consultation amounts to the first "major review" of Canada's investor protection agreements in a decade. "The world has changed dramatically since then." "We're looking to reinforce the rules-based system, and that includes reforming the [World Trade Organization]," Carr said. Canada is planning a meeting of like-minded trading partners — including the European Union but excluding the U.S. and China — to discuss options for WTO reform Oct. 24-25 in Ottawa. Some suggest a beefed-up WTO could protect investors better than all these bilateral and regional agreements, although it's not clear that enough countries want that to make it happen. "We want to prepare ourselves with the best advice available to take to a very dynamic period," Carr said. Does that mean trying to make Canada's foreign investment agreements more consistent with each other? "I think there might be a movement towards that," Carr said. The most common complaint about ISDS is that it allows private investors to punish governments for policies that affect the bottom line but also protect the public interest — environmental laws, for example. So does the Trudeau government think its current treaties aren't "progressive" enough to fit its agenda? "I wouldn't want to prejudge what people say," Carr said. The preliminary trade agreement the U.S. recently reached with Mexico may offer a glimpse of what could happen with NAFTA's Chapter 11. A U.S. official said the two countries wanted ISDS to be "limited" to cases of expropriation, bias against foreign companies or failure to treat all trading partners equally. However, for "companies that have contracts with the government," the official continued, "old-fashioned ISDS" would remain in play for certain sectors: oil and gas, infrastructure, energy generation and telecommunications. Canada has been the target of more Chapter 11 claims than the other two NAFTA partners. It's lost more ISDS cases than the U.S. (which has never lost) or Mexico — which is why some find the idea of Canada defending it at the NAFTA table odd. Longtime opponents of Chapter 11, including the Council of Canadians, cheered the preliminary agreement with Mexico as a sign that ISDS could be weakened in a renegotiated NAFTA. But they'd go farther, citing their own public opinion research that suggests a majority want Chapter 11 eliminated. Manak said that as the U.S. abandons ISDS, Europeans are shaping a new narrative for dispute settlement by appointed judges. Unlike rulings issued by NAFTA ISDS panels, those judges' rulings can be appealed. Civil society groups who lobby on sustainable development and labour issues aren't necessarily fans of the European investor court idea. They argue that, between developed democracies, legal disputes should be left to domestic courts. "We still should question whether we need [the European model] at all," Manak said. Investors will face a "spaghetti bowl of rules" if treaties aren't more consistent. "Canada has been very smart about revising treaties based on their experience with arbitrations," said Mona Pinchis-Paulsen, a Canadian investment lawyer conducting post-doctoral research at New York University. Pinchis-Paulsen did research for a Chapter 11 challenge by an American mining company, Bilcon, after an environmental review blocked its proposal for a quarry in Digby Neck, N.S. Bilcon sought $443 million in damages. It won. Pinchis-Paulsen said Canada's treaties with China and the EU offer investor-state dispute arbitrators much more guidance than does NAFTA on things like the government's right to regulate. "It's interesting to see whether they're doing this consultation as a way to legitimize perhaps more detailed rules for the NAFTA," she said. "They probably already know where they want to go." ISDS does seem incompatible with other Trudeau government priorities. "Indigenous peoples are damaged by investment agreements," said Risa Schwartz an international lawyer who has researched their impact on treaty rights enforcement. Domestic judges in Canada understand how Indigenous peoples are protected by the Constitution, she said. Ad hoc Chapter 11 panels may lack expertise in Indigenous law. Schwartz worries about regulatory chill. When governments fear being sued under ISDS, do they make different decisions? Take the Trans Mountain pipeline extension, she said. Was the government's decision to buy the pipeline influenced by fear of an expensive Chapter 11 lawsuit if approval wasn't granted? Assembly of First Nations National Chief Perry Bellegarde sits on Freeland's NAFTA advisory panel. "You cannot trade what is not yours," he wrote in an op-ed in the Toronto Star. Translation: don't ratify agreements that conflict with our treaties. Negotiators could add an exemption to NAFTA to protect Indigenous rights, Schwartz said. Or they could just kill Chapter 11 altogether. An earlier version of this story said that the meeting Canada will host to discuss WTO reform would be held Oct. 25-26. Since its publication, the date for this meeting has been moved up a day, to Oct. 24-25. An earlier version of this article said that Canada has been on the losing end of most of the ISDS cases it's faced. It's been corrected to say that Canada has lost more cases than the U.S. and Mexico.